ISLAND IMAGES » After being closed since July 18 due to mold problems, the University of Hawaii's Kennedy Theatre reopened yesterday. The Jingju Physical Performance class took to the stage to rehearse an upcoming play, "Women Generals." 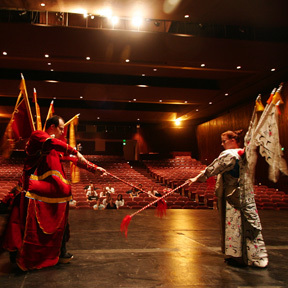 Nick Logue, left, and Dusty Behner demonstrated Chinese sword-fighting techniques. Debt-ridden consumers are stampeding Honolulu's bankruptcy court to beat an Oct. 17 deadline, when a new federal law will make it harder for people to wipe out their credit card debts. Forecasters say the islands dodged the worst of Tropical Depression Kenneth yesterday, but flooding is still possible today, with heavy showers expected on Oahu through tonight. Kennedy Theatre is back in action after a $170,000 mold cleanup that forced the cancellation of the University of Hawaii's season opener. The Broncos, riding 26 straight WAC wins, will likely have something up their sleeves. Saint Louis beats No. 1 Kamehameha and both teams join Punahou at 1-1 in the tight ILH. But the company expects to reap benefits from the new service in the longer term.